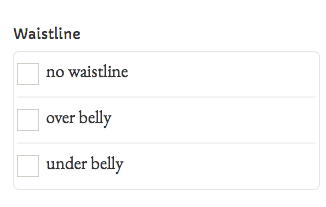 One of the options Maternity Sewing offers in its comprehensive pattern shop search feature is “waistline”. The waistline can apply to either bottoms or tops and can either be above the belly, below the belly, or nonexistent. We’ll talk you through why you might want to select a specific waistline and show some examples of what that looks like. 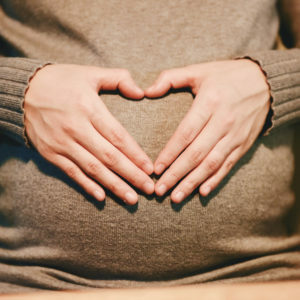 Many women find it convenient to wear skirts and pants with a waistband that goes bellow the belly because they require less adjusting to fit throughout your pregnancy and they are more likely to be able to worn in your fourth trimester and beyond. When Erin was pregnant she preferred pants with an under-belly waistband because it meant wearing fewer layers of fabric over her belly in early pregnancy but she couldn’t wear them in her late pregnancy because she found them uncomfortable as the pressure on the waistband needed to keep the pants up dug into her sensitive skin. 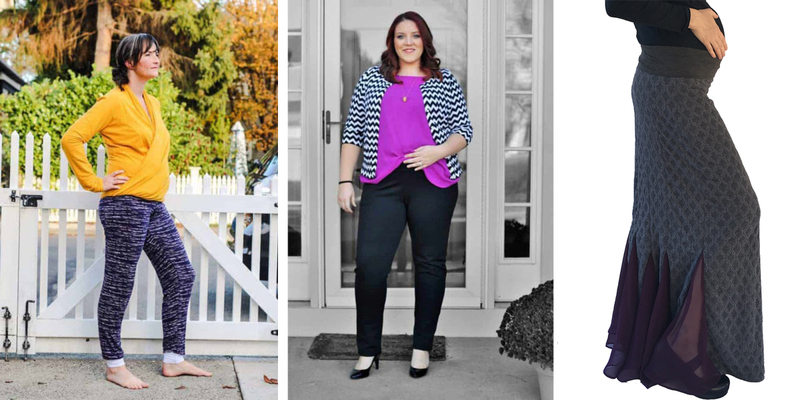 Examples of pants with bellow the belly waistbands are Diane Joggers, Sabrina Slims, and Zen Pants. See all pants and skirts with under-belly waistbands. So why wear bottoms with a waistband that goes over your belly? You may find it uncomfortable to wear a garment below the belly as it has to press tightly into your body to stay up. This can be true at any stage in your pregnancy but is likely to be particularly true in your third trimester as a below-the-belly garment has to be lower and tighter to stay up and your body is sensitive from being so stretched. Why not use an above the belly waistband all the time? Some women, especially those who are in late pregnancy during summer, find the extra layer of fabric to be uncomfortably warm. Examples of bottoms with waistbands over the belly are the Arcadia Joggers, Goldilegs Jeans, and Runway Skirt. See all pants and skirts with over-belly waistbands. The waistline in tops and dresses don’t need to support the garment so picking a waistline is more of a style decision than for bottoms. A top or dress without a waistline can have a swing or a-line shape which allows for the garment to be easily used as a fourth trimester (and beyond) garment without looking like a maternity garment. In this category you’ll find a lot of patterns that weren’t designed as maternity patterns but that are very maternity friendly because of their style. 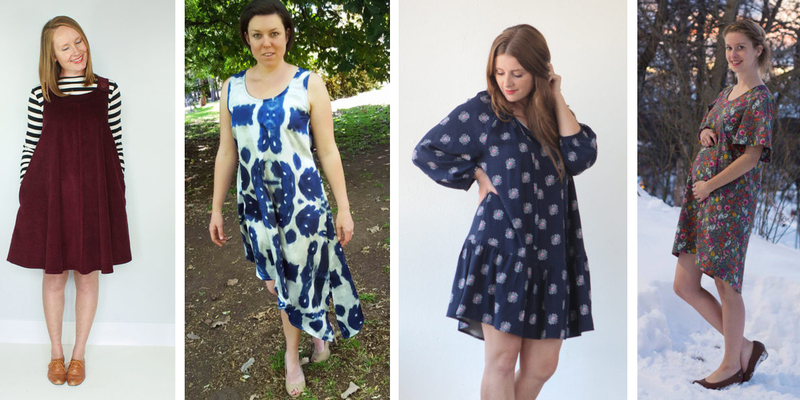 Examples of un-fitted tops and dresses are the Ivy Pinafore, Miss Isabella Top/Dress, Roscoe Blouse/Dress, and Sirocco Top/Dress (though you’ll find tons more great examples in our shop – this is our biggest category!). Maternity tops and dresses without waistlines can also be fitted if they use pleats or gathers to add the necessary fabric to accommodate a large belly. 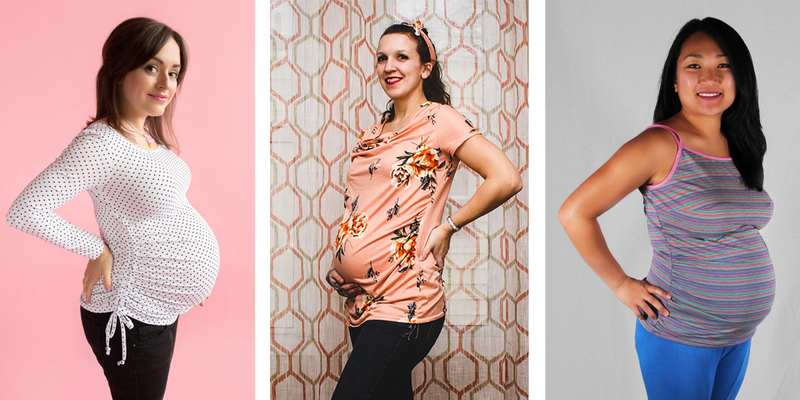 Examples of fitted maternity tops/dresses without a waistline are the Agnes Top, Camilla Top & Dress, and Tropo Maternity Camisole. Of course cropped tops are also a versatile waistline-free option – if it doesn’t go down as far as your belly then you don’t have to worry about fitting your belly. 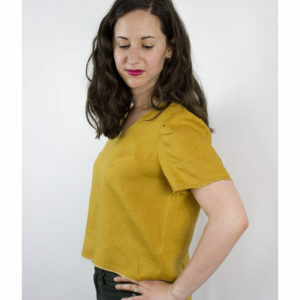 Example of cropped tops are the Citron Twist Shrug and Ultraviolet Maternity Tee. See all tops and dress with no waistline. A top or dress with defined waistline above the belly (often called an empire waist) allows the garment to be fitted in the chest and loose through the middle which can be great whether you want something loose over your post-partum belly or need to accommodate a large late-maternity belly. 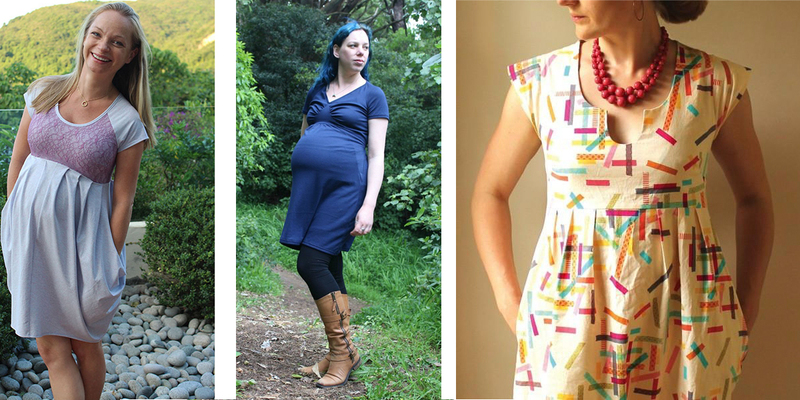 Examples include the Darcy Mama Dress, Natalie Dress/Top, and Washi Dress. See all tops and dresses with waistlines above the belly. Some tops and dresses may have a defined waistline that is below the belly. 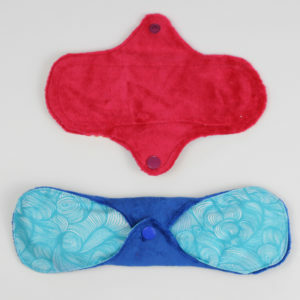 This allows the excess fabric needed to go over your pregnant belly to cinch back down and create a slim silhouette. 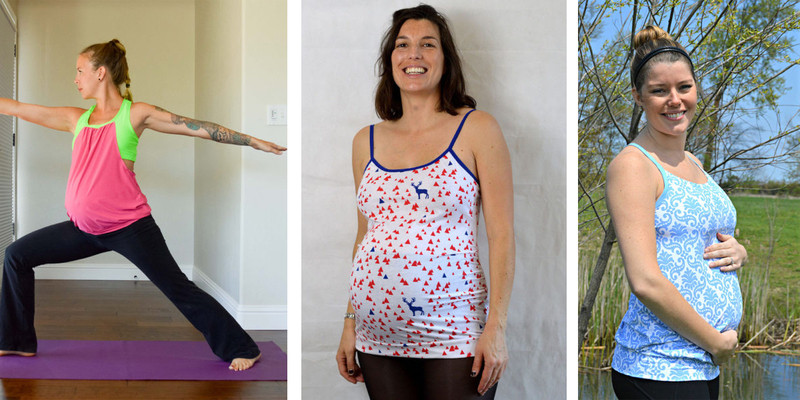 Examples include Agility Overlay Tank & Dress, Cordelia Maternity Camisole, and Lakeshore Tank. See all tops and dresses with waistlines below the belly.